When you visit Madeira, you’ll find the typical souvenir shops that sell Honey cake and Madeira wine. They are both great and I recommend it. However, one of the things I like when I travel is to seek for shops of local designers, which I do not find elsewhere. With this globalization, I always get a bit annoyed to see the same kind of shops everywhere and it delights me when I find a special store or any item that is unique. I also like to go home and whenever I look at that piece, I have a story to tell, being able to associate it with a moment of my life, or the person who gave it me. Incidentally, this is also one of the pleasures of traveling, finding pieces that tell stories (eventually) have a sentimental, timeless value. So I proposed myself to show my readers special gifts from Madeira. 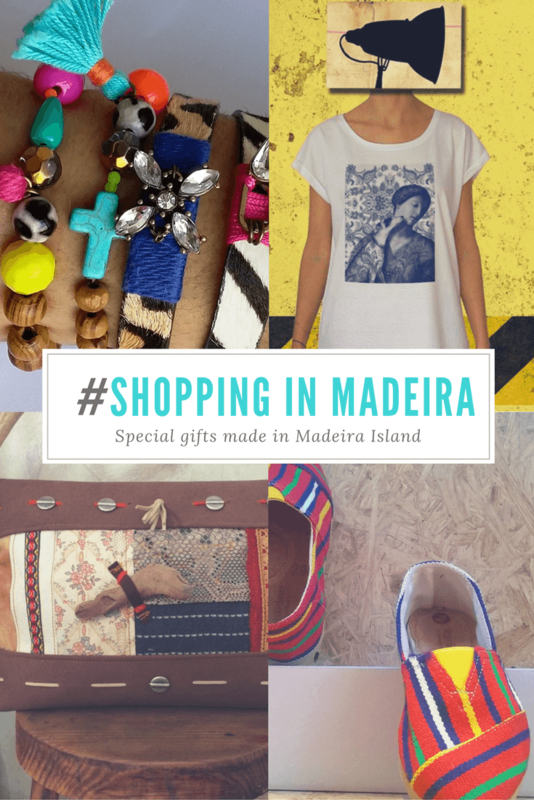 I suggest wonderful gifts to yourself (or to anyone you like giving special gifts to), which are the result of Madeiran creativity, ranging from clothing, accessories and even handmade products. 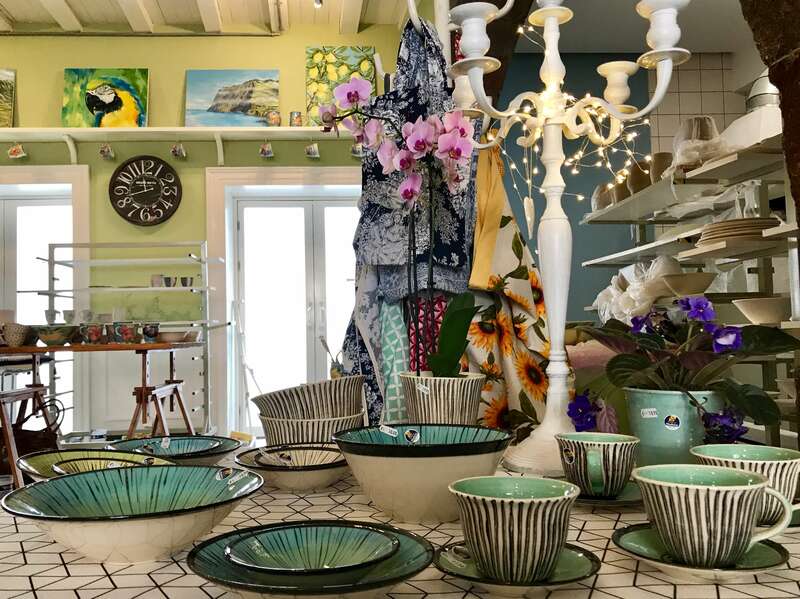 Meet the lovely Lillie sisters, Lillie Ceramics who recently opened up a pottery just behind Mercado dos Lavradores, in Funchal. 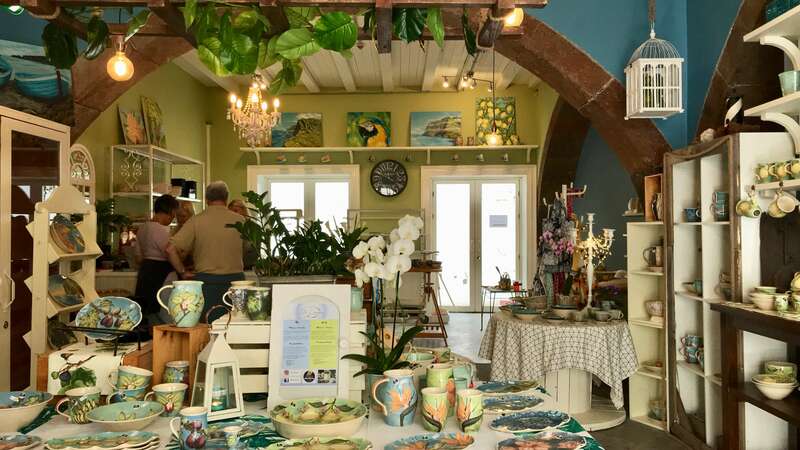 Together they make beautiful ceramics, mostly table ware, using the potter’s wheel and painting by hand, inspired by Madeira’s landscapes. This place is so beautiful, combines talent, soul and happiness in a work studio/shop where customers are welcome. So if you’re looking for a special gift from Madeira, this can be it! They also make customized gifts for a special occasion, person, or pet! They ship abroad too, in case you’re running out of space in your luggage. So please have a look at this place and see for yourself what I mean ;). I learned to value Madeira Embroidery when I realized how much time, hand expertise and devotion exists in the construction of each piece. Each point has its science, transmitted from mothers to daughters, from embroiderer to embroiderer. Read this article to see 5 ways to use Madeira Embroidery. It’s for sale at the online store www.linoandaraujo.com or at Rua dos Murças nº 2, 8 and 19, Funchal, Madeira. Bohochick ” goes beyond a trend, it’s a state of mind, it’s having a heart full of the world, it’s to search for the unknown and to find the unexpected.” This store brings together various national and international brands, of clothing, decorative objects, jewelery, bags, collars etc. I felt in love with the design on this t-shirt. It shows a raw but vibrant heart that speaks of vulnerability. 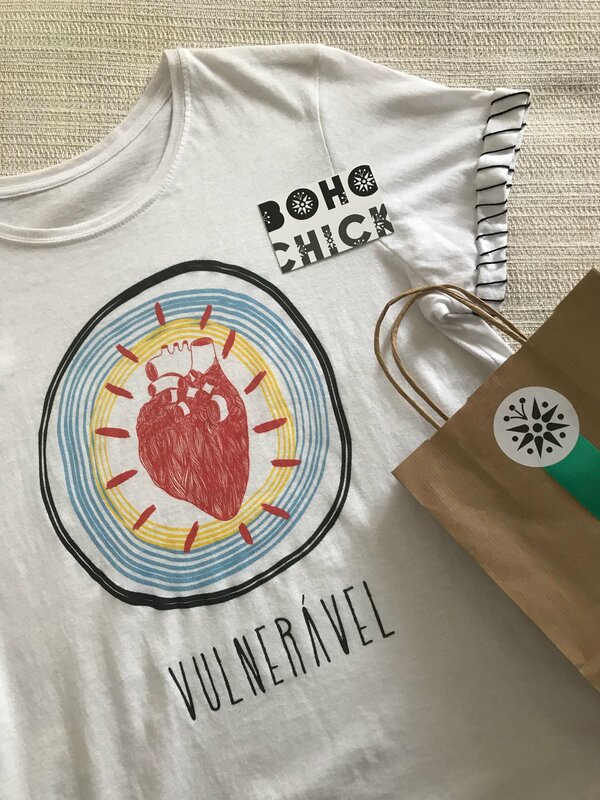 Each t-shirt comes with a poem and a message from a Brazilian artist – Vital Lordelo Neto. 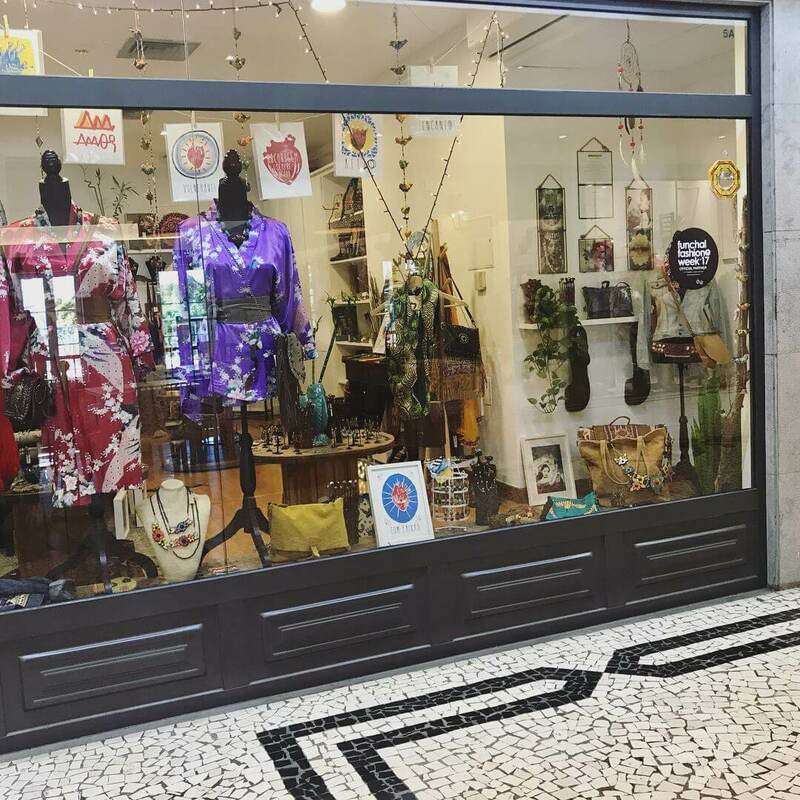 Pay a visit to this shop in the Gallerias São Lourenço and discover unexpected gifts of love. 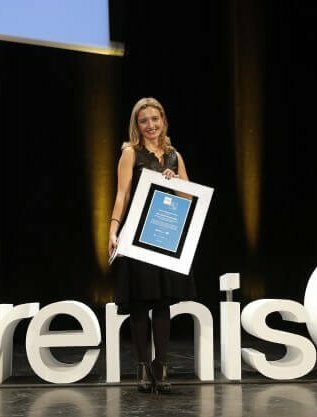 Patricia graduated in fashion design and communication at IADE in 98. She created the brand “Patricia Pinto” and since 2003, she designs individual collections. I love her clothes, bags, accessories, details and quality of her creations. Her shop is a delight, with an interior garden and a very unique style; talent, charm and friendliness as only Patricia has. Don’t miss it! Sofia Paulino is the designer of Nawak brand which means “N’importe quoi!” It doesn’t matter which materials and images you choose, what matters is to create something soulful, female and colorful. Andreia enjoys working with quality products and some secret ingredients: love, dedication and time! The vast majority of the pieces is unique and they are all handmade with great care and profound attention to detail. The result is in sight and is as irresistible as a secret garden. What a talent! This “Mary” gets me “crazy” with her creations. This nurse has a special hobby: making beautiful things that give you pleasure and work as a therapy for the senses. 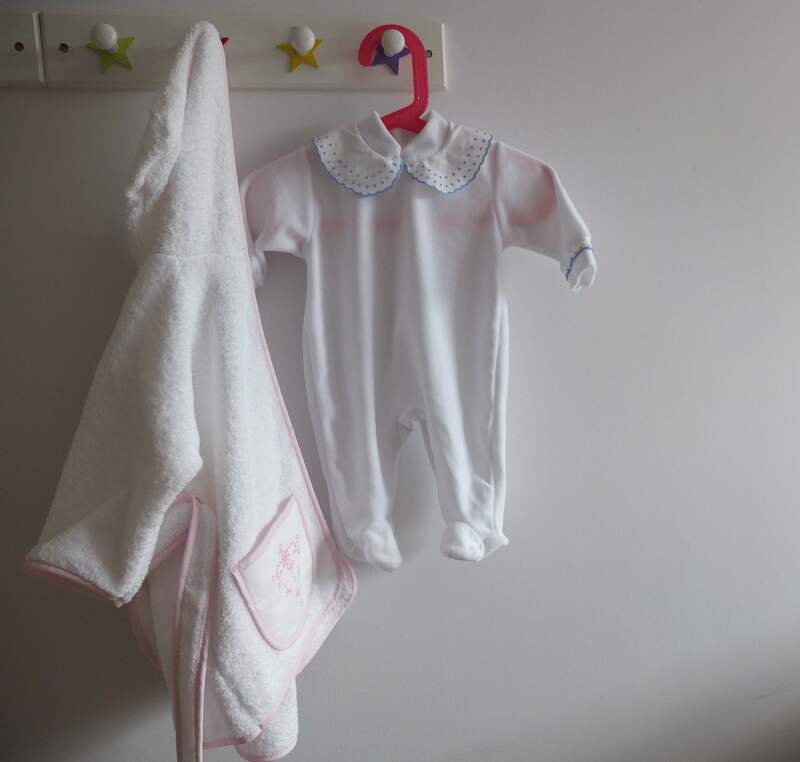 She has always liked crafts, from sewing, collages, creations, choosing the fabrics and how to arrange and mixing colors. Shops: Traditions, Rua da Sé No. 30, Funchal. Wao means Are One (of English: We are one). They are attitude, feeling, unity. What unites fans of this brand is simple: An urban style with quality materials, patterns and unique design. It is 100% made in Portugal and was born in Madeira, despite all the differences that make us unique, we are all made of the same. This brand also aims to convey a message of peace, respect and acceptance of others. For the WAO there is only one race, the human race. If you’re an art lover this is the place to be. Carla has a giant heart and this is reflected in her art. Describing her talent is not an easy task, but to help you understand it, I leave you with the excerpt from her biography, described (brilliantly) in her page by Gito Lima. As for the work for sale, she has some available oils and drawings in her studio. Those who are interested just send a message via Facebook . “Bluette”: bring hert art to travel. Looking for the shopping hub in Funchal? Rua Fernão de Ornelas is one of the main shopping street as well as the pedestrian streets nearby the area of Sé Cathedral. It has 3 floors with many shops, bookstore, pharmacy, a large eating area, a gym and a supermarket. It has onsite parking area but it is paid. On Sundays it’s free. It is located in the tourist area of Lido and has numerous shops, bookstore, a supermarket and a cinema. It also has a paid car parking onsite. On Sundays parking is free. This shopping center is located in the tourist area of Lido, offering some shops and services including a medical center and tourist information office. It also has some restaurants on the terrace. It is the largest commercial centre in the Island. It has several shops including a bookstore, supermarket, pharmacy and cinema which displays movies in the original languages. It also has a FREE car parking. Small downtown area with shopping and dining. It has a paid parking. Small shopping center with shops and cafes. It has a paid parking área. This shopping center is near the Farmers Market. It has several shops, dining area and supermarket.